Danny Ties offer a unique tube holder with a softer and more comfortable fit around the neck for patients of all ages. The quilted design of the Danny Ties minimizes skin irritation under the collar and stabilizes the position of the trach tube. 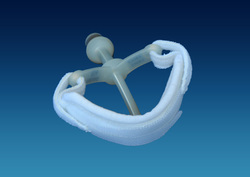 The patient with a tracheostomy needs to have a tube holder that securely holds the artificial airway in place to prevent accidental decannulation. As important, the tube holder needs to provide a soft, comfortable fit about the neck while minimizing skin irritation under the collar. Danny Ties are made of soft, absorbent cotton that lays smooth at the edges of the collar and reduces skin breakdown beneath the collar. The patent pending design of the Danny Ties evenly distributes the quilted collar around the neck to minimize pressure points on the skin. The Danny Ties collars are easy to apply with tapered ends on the collar straps. The ends thread easily through the eyelets of the tracheostomy tube allowing for quick application and changes of the collar position on the smallest of infants and the large adult patient. The collar is engineered to hold its shape, not fold in half around the neck when the patient turns and does not stretch when it absorbs moisture. If soiled, Danny Ties may be washed, dried and reused for the same patient per hospital policy. Danny Ties are developed with special care by a dad wanting to “make a difference” for his son and change the quality of life for tracheostomy patients. His engineering expertise and commitment to finding a better solution is found in the Danny Ties. Danny Ties improve the position of the tracheostomy tube against the trachea with one piece design. Better fit for very small infants. 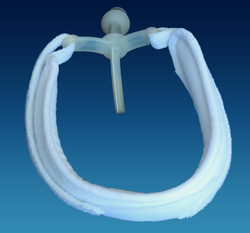 Easy threading of the ties through the tracheostomy flange with the contoured ends of the strap. Reinforced stitching at the ends of the tie strap to ensure ease of threading and repositioning of the collar. Easy threading of the ties through the trach flange with the contoured ends of the strap. Cotton material absorbs moisture and wicks away from patient/does not stretch when moist. 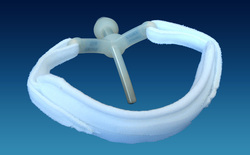 Danny Ties improve the position of the trach tube against the trachea with one piece design. Danny Ties ™ are economical. The ties may be gently washed, dried and reused for the same patient.